Mitchiner dates Ardeshir's reign as AD 226 to 240, and Sellwood to AD 224 to 242. The difference in the starting date appears to be that Sellwood starts it when Ardeshir defeated the Parthian King Artabanus V in AD 224, but Mitchiner dates the reign from AD 226 when Ardeshir was actually Coronated as King. I am not sure why they have different ending dates. Mint & Date : This issue does not have mint or date marks. Size : 23.7 x 24.2 mm. Weight : 4.05 grams. Reference : Mitchiner Ancient #789 to 795. Grade : VF darkly toned. 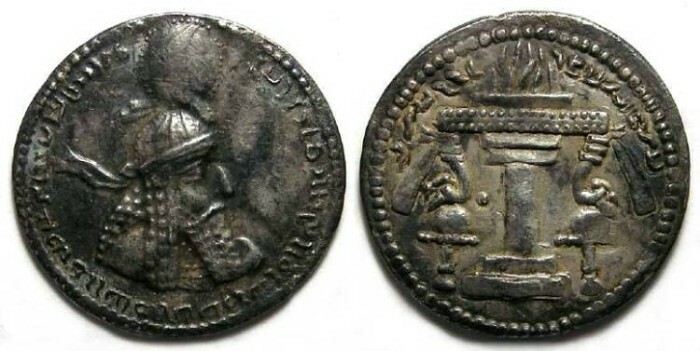 Obverse : Head of Ardeshir I right, with with his typical headress and long beard, and a long Sassanid inscription around that translates roughly to "OF THE WORSHIPPER OF MAZDA, THE DIVINE ARDESHIR, KING OF KINGS OF IRAN"
Reverse : Fire altar (without attendants), with Sassanid inscriptions to the left and right above, which transliterate roughly to NURA ZI ARTaHShaTR (meaning FIRE OF ARDESHIR).